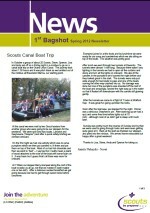 Welcome to 1st Bagshot Scout Group. If you used to be a 1st Bagshot Scout or leader, then why not join our Alumni email list. Just click on the picture and follow the instructions. The Summer term newsletter is now available. We’re not producing paper copies for all this time in an effort to save some trees, but if you want a hard copy and don’t have access to a printer, or you are having trouble viewing the file please let a Leader know.